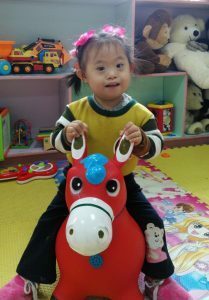 One year ago we announced that Caroline, an adorable little girl who rocks her extra chromosome, had been matched with a Forever Family. Her family had fallen in love with her the first time they’d seen her photo, and from that moment on they knew she was theirs. Since then, we’ve continued to follow their journey and shared in their joy with each surprise along the way. Throughout their adoption process they’ve shared several stories with us, including Finding Caroline the story of how they came to be matched with their daughter, and First Father’s Day. Along the way we’ve been so impressed by their diligence in completing their dossier paperwork and wrapping up the final steps of their adoption. Now, we’re so happy to share with you the moment when all of the pieces came together as they welcomed the newest member of their family, Caroline. 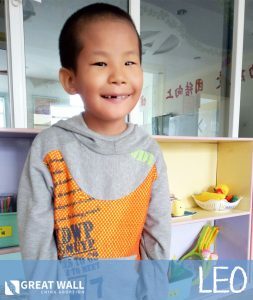 One month ago, Caroline’s dad traveled to China to finalize her adoption and bring her home. The video below shows the moment when the two of them arrived home and Caroline got to meet her mom for the very first time. There are few things as incredible as getting the chance to be involved with a family’s adoption process from start to finish. With the “M” family, I had the unbelievable chance to get to work with them from the time they began the adoption process until they left to pick up their darling girl. They were one of my first families to match, and will always be in my heart as one of the first times that I felt as though I was truly making a difference for the kiddos that we advocate for. I have loved looking at their little girl’s photos since the time we received her file, so to now see her home and in her parent’s arms feels like such a blessing. Throughout all of the emotional ups and downs of the adoption process, it is moments like these that make it worth every minute. Wonderful, Beautiful, Extra Special Day! Congratulations! Congratulations on your adoption , she is beautiful May God continue to bless you and your beautiful family . Thank you for sharing such a special moment. We cannot wait for ours.